War Chest: Katowice 2019 brings two brand new features that we’ve never been able to offer before! You guys asked for it, and we’re ready to deliver: each race is receiving a full suite of custom building skins! Now, you’ll be able to complete your race’s transformation into the Simulant Zerg, the Terran Special Forces, and Protoss Forged. Secondly, not only can you earn progress by playing StarCraft II, you’ll also be able to earn War Chest progress simply by watching StarCraft II. Spending time with your favorite StarCraft II streamers will now earn you experience towards your War Chest loot. Anyone who wants to stream StarCraft II can help their fellow RTS fans gain experience as long as they install the StarCraft II War Chest Extension. More on that in a moment. Earning experience for your War Chest is simple. First, make sure you’ve purchased the War Chest! Second, log into your Twitch account and make sure your Battle.net account is linked to your Twitch account. Third, watch an eligible StarCraft II streamer. How do you know who’s eligible? You’ll see the War Chest extension icon on the edges of the stream. If you want to take all the guesswork out of finding out who’s eligible, we’ve partnered with these streamers, who we know will be ready to provide oodles of XP-unlocking entertainment. Once you’ve found a StarCraft II stream to watch, the extension will be your guide to tracking your progress. After about 20 minutes of viewing, the extension will notify you that you have experience to claim. Click “Claim XP” to credit your account with the viewing time you put in. It’s important that you’re a diligent viewer because you cannot earn any additional experience if you have pending experience to claim. Whenever you want to see exactly where you stand, you can always log into StarCraft II to verify your earnings. If you have any other questions about earning experience for the War Chest, you can review our FAQ. If you already stream StarCraft II and want to allow your viewers to earn War Chest progress, you’ll need to do two things. First, make sure your Battle.net account is linked to your Twitch account, and install the StarCraft II War Chest extension. Click here to download it and click here for more general information on installing Twitch extensions. Once it’s installed, just stream StarCraft II like normal and you’ll help players unlock those sweet building skins. You should now be ready to begin your campaign for War Chest: Katowice 2019! Get your favorite snacks and drinks ready and start watching your favorite StarCraft II streamer. For more details about this program, please review our FAQ below. GLHF! Q. How can I begin earning War Chest XP on Twitch? Step 1: Purchase a StarCraft II Katowice 2019 War Chest. Step 2: Link your Blizzard account to your Twitch account. 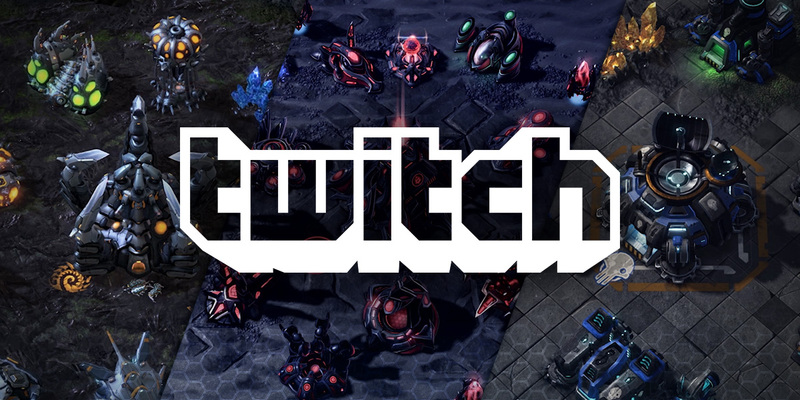 Step 3: Head over to Twitch, log in to your linked account, and check out who’s streaming StarCraft II. Step 4: Find any StarCraft II stream that’s enabled the War Chest extension. Step 5: Grant the War Chest extension access to your Twitch ID and watch for at least 20 minutes. Step 6: When it appears, click the “Claim XP” button in the extension to redeem your reward. Step 7: Log in to StarCraft II to add the XP reward to your War Chest. 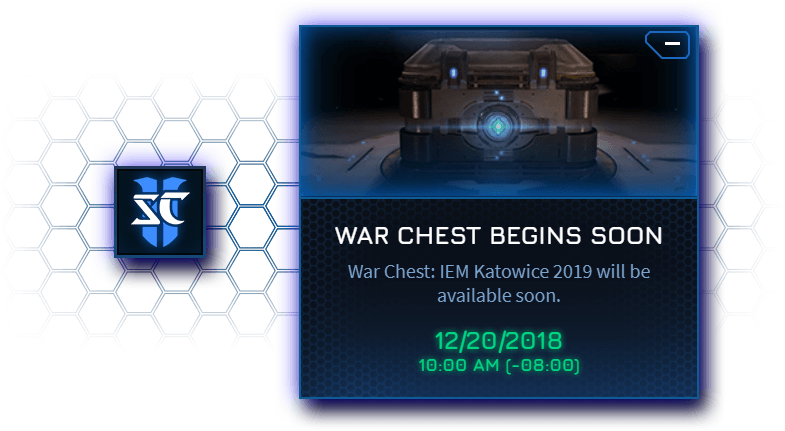 Check out our official webpage for additional information on the Katowice 2019 War Chest. To learn more about earning War Chest XP on Twitch, click here. Q. Where can I purchase the Katowice 2019 War Chest? A. You can purchase a Katowice 2019 War Chest for the race of your choice for $9.99 each or buy the complete bundle for $24.99 on the Blizzard Shop. This War Chest offer is only available for a limited time, though! Be sure to buy yours before March 14, 2019. Q. How do I link my Blizzard and Twitch accounts? A. Log in or create a Twitch account. Navigate to your Twitch connections page (Settings > Connections), find the “Blizzard Battle.net” section, select your preferred gameplay region, and click Connect. Before linking your accounts, check to see that you’re not logged into any other Blizzard accounts in the same browser, as this could cause complications. For the best results, we recommend completing the process in “private browsing” or “incognito” mode. Click here to learn more. Q. Does it matter which Blizzard account is linked to my Twitch account? A. Yes! If you have multiple Blizzard accounts, please make sure the Blizzard account currently linked to your Twitch account is the one on which you wish to redeem any War Chest XP you earn by watching StarCraft II streams on Twitch. War Chest XP cannot be transferred to another Blizzard account. Q. How can I tell which Blizzard account is linked to my Twitch account? A. You can see which Blizzard account is linked to your Twitch account on the Twitch connections page. Q. How do I grant the War Chest extension access to my Twitch ID? A. In order to receive a War Chest XP reward on Twitch, you will need to provide the War Chest extension access to your Twitch ID. If you haven’t provided this access, you should see an “Extension Needs Your Permission” message. Once you’ve granted permission, you will see the War Chest extension listed under the “Extension Connections” section of the Twitch connections page. Q. When can I start earning War Chest XP on Twitch? A. You can earn War Chest XP on Twitch starting December 20, 2018 after 10:00am PT. To be eligible to earn this XP, you must first link your Blizzard and Twitch accounts and purchase a War Chest. Q. When can I no longer earn War Chest XP on Twitch? A. You will no longer be able to earn War Chest XP on Twitch after April 11, 2019 at 10:00am PT. If you have not unlocked all your War Chest building skins by this point, but still wish to own them—don’t worry! You will have the opportunity to purchase the skins from the Blizzard Shop at a later date. Q. When does each War Chest: Katowice 2019 reward phase begin? New War Chest items will become available in Phases I, II, and III. After Phase III concludes on March 14, 2019, all War Chest items will be available to unlock until April 11, 2019. During this time (Phase IV), you’ll also earn double War Chest XP—both in-game and on Twitch. Check out our official War Chest: Katowice 2019 webpage to see which rewards unlock in each phase! Q. How much War Chest XP will I earn per reward on Twitch? A. To earn a War Chest XP reward on Twitch, you must watch at least 20 minutes of any eligible StarCraft II stream on Twitch that’s enabled the War Chest extension. From December 20, 2018 to March 14, 2019, each reward will provide 50,000 XP that you can add to your War Chest in game. From March 14, 2019 to April 11, 2019, each reward will provide 100,000 XP. Q. How can I tell if I’ve received a War Chest XP reward on Twitch? A. Once you’ve earned a War Chest XP reward on Twitch, the War Chest extension will update to display a “War Chest XP Earned” message. Just below that message, you will see a “Claim XP” button—click it to redeem your reward and then log in to StarCraft II to add it to your War Chest! Q. Is there a cap to how much War Chest XP I can earn on Twitch? A. There are no caps (daily, weekly, per stream, etc.) to how much XP you can earn on Twitch. Q. Will War Chest XP I earn on Twitch apply to all regions? A. Yes! The XP you earn on Twitch will be added to your War Chest progress in all gameplay regions in which you have an existing StarCraft II character. Q. Can I earn War Chest XP in-game, too? A. Yes, you can also earn War Chest XP by playing Versus or Co-op matches during the War Chest period. Unlike War Chest XP earned on Twitch, however, XP earned in-game will be limited to the gameplay region in which you’re playing. Q. Can I unlock all my War Chest items just by watching StarCraft II on Twitch? A. Yes! If desired, you will be able to earn all the War Chest XP needed to unlock your War Chest items exclusively by watching StarCraft II on Twitch. Q. How do I know when I’ve completed my War Chest and unlocked all items? A. Once you’ve unlocked every War Chest item in all gameplay regions in which you have an existing StarCraft II character, the War Chest extension will update to display a “War Chest Complete!” message. Please note that you can also check the status of your War Chest at any time in the StarCraft II game client. After you complete your War Chest, you will no longer be able to earn additional War Chest XP. Q. How can I tell if a StarCraft II stream is eligible to provide War Chest XP? Official and featured StarCraft II streams will always be eligible. Check out our War Chest Twitch Team page for a list of featured channels. If you’d like to set up your Twitch channel to provide War Chest XP, click here to get started. Q. If I watch multiple streams can I earn War Chest XP more quickly? A. No, War Chest XP rewards are considered part of a Twitch Drops program and thus can only be earned from viewing one stream at a time. Please note that if you are watching multiple streams broadcasting StarCraft II with or without an active Twitch Drops program, this may actually interfere with your ability to earn Twitch Drops at all. Q. Why am I not earning War Chest XP on Twitch? A. There are several reasons why you may not be receiving War Chest XP rewards when watching on Twitch. Please review the below list to assist with troubleshooting. You still need to create a Twitch account. Create one here! You still need to create a Battle.net account. Sign up now! You still need to create a StarCraft II character. Install StarCraft II and log in to get started. You still need to purchase a Katowice 2019 War Chest. Head over to the Blizzard Shop to purchase one today or learn more about what’s included. You still need to link your Twitch and Battle.net accounts. Visit the Twitch connections page to set up or manage your account link. You still need to grant the War Chest extension the right permissions. In order to receive a War Chest XP reward on Twitch, you will need to provide the War Chest extension access to your Twitch ID. If you haven’t provided this access, you should see an “Extension Needs Your Permission” message. Once you’ve granted permission, you will see the War Chest extension listed under the “Extension Connections” section of the Twitch connections page. You still need to claim the last War Chest XP reward you earned. Hit the “Claim XP” button in the War Chest extension to redeem any pending rewards. Please note that an unclaimed reward will prevent you from earning progress towards your next one. You are not logged in to your linked Twitch account while watching. If you are not logged in, you will not be able to earn any War Chest XP rewards. You are not watching for a long enough period of time. You will need to watch a minimum of 20 minutes on an eligible stream to earn a War Chest XP reward. You are not watching from an eligible device. At this time, viewers may only earn War Chest XP on Twitch when watching StarCraft II from a desktop Web browser or through the Twitch for iPhone and Twitch for Android apps. This means you will not be able to earn War Chest XP if you are watching StarCraft II from the Twitch Desktop App or from the official Twitch app on Xbox One, Xbox 360, PlayStation 4, Chromecast, Fire TV, Roku, or the NVIDIA SHIELD. You are not watching from a Twitch channel page. At this time, viewers may only earn War Chest XP on Twitch when watching a StarCraft II stream on a broadcaster’s channel page. You will not be able to able to earn War Chest XP if you are watching StarCraft II on the Twitch front page carousel, a Twitch Team page, the Battle.net launcher, or any other location in which the stream may be embedded. You are not watching an eligible StarCraft II stream. In order for a StarCraft II stream to be eligible to provide viewers War Chest XP, the broadcaster must have 1) linked their Twitch and Blizzard accounts and 2) installed and activated the StarCraft II War Chest extension. Not sure which streams to watch? Check out the channels listed here! You are watching too many StarCraft II streams at the same time. Watching multiple StarCraft II streams may prevent you from accruing watch time towards your next War Chest XP reward. To avoid these potential issues, we recommend only watching one StarCraft II stream at a time. You do not have the StarCraft II stream set as your active browser tab. If the StarCraft II stream you’re watching is not your active browser tab, this may prevent you from accruing watch time towards your next War Chest XP reward. To avoid this potential issue, we recommend that you do not have any other Twitch tabs open when watching StarCraft II. You have muted or minimized the StarCraft II stream. If you mute or minimize the StarCraft II stream you’re watching, you will no longer be able to accrue watch time towards your next War Chest XP reward. Please be sure to unmute the stream and check that the browser in which you’re watching is not minimized. You have a browser plug-in that’s interfering with your eligibility. To make sure you’re eligible for War Chest XP rewards on Twitch, we recommended that you temporarily disable your plug-ins when watching participating StarCraft II stream. Neither Blizzard nor Twitch can provide support for issues caused by incompatible browser plug-ins. You have unlocked all available War Chest items for the current phase. You will need to wait until the next phase begins to continue earning XP. Countdown timers can be found in-game and within the War Chest extension. You have completed your Katowice 2019 War Chest. Congratulations! You’ve unlocked all War Chest items in all gameplay regions in which you have an existing StarCraft II character. Since you have completed your War Chest, you can no longer earn any additional XP. This War Chest program has concluded. You will no longer be able to earn XP for the Katowice 2019 War Chest after April 11, 2019. Don’t worry—if you don't complete your War Chest before the deadline, all War Chest skins will become available for purchase at a later date. StarCraft II is currently down for maintenance. When StarCraft II is offline, you will not be able to receive any War Chest XP rewards. Check out @BlizzardCS on Twitter for maintenance schedules and the latest game status updates. Q. What is a Twitch Extension? A. Extensions are interactive web apps that run on a Twitch broadcaster’s channel, either overlaying the video player or appearing below it as a panel. Click here to learn more. Q. What is the StarCraft II War Chest extension? A. The StarCraft II War Chest extension is what powers our ability to provide War Chest XP on Twitch. When installed and activated, it allows eligible viewers to claim bundles of War Chest XP in exchange for watching StarCraft II streams on your channel through April 11, 2019. The extension also displays important information for viewers, including where to purchase a War Chest, when the next phase of a War Chest begins, and how to make sure they are eligible to receive War Chest XP on Twitch. Click here to learn more. Q. On which platforms is the War Chest extension supported? A. When activated, the StarCraft II War Chest extension will be visible to all viewers who visit your Twitch channel page using a desktop Web browser or the Twitch app for iOS and Android. Q. How can I provide War Chest XP on my Twitch channel? Step 1: Link your Twitch account to your Blizzard account. Step 2: Install the StarCraft II War Chest extension[LINK] from Twitch Extensions dashboard. Step 3: Go to your Extensions Manager to configure and activate the extension. Step 4: Set up your stream in the Twitch Live dashboard, selecting “StarCraft II” for Game/Category field. Step 5: You are now ready to begin broadcasting StarCraft II! If any of these requirements are not met (i.e. your accounts are not linked, the extension isn’t activated, your stream category isn’t set as StarCraft II, and/or you’re not streaming the correct game), your viewers will not be able to claim any War Chest XP rewards on your channel. For more information on managing your Twitch Extensions, visit the Twitch Help Center portal. Q. Does it matter which Battle.net account is linked to my Twitch account? A. For the purpose of providing viewers the opportunity to earn War Chest XP by watching StarCraft II on your Twitch channel page, it does not matter which of your Blizzard accounts is linked to your Twitch account. However, if you also wish to earn War Chest XP by watching other StarCraft II streams, please make sure the Blizzard account currently linked to your Twitch account is the one on which you wish to redeem those rewards. War Chest XP cannot be transferred to another Blizzard account. Q. What kind of Twitch Extension is the War Chest extension? A. The StarCraft II War Chest extension is a Component Extension, which means it will appear on your Twitch channel page within the video player when viewing from a desktop Web browser or as a separate panel beneath the video player when viewing from the Twitch app for iOS and Android. Q. Can I have more than one Component Extension activated at one time? Q. What happens if I activate the extension, but don’t stream StarCraft II? A. If you’ve installed and activated the StarCraft II War Chest extension on your Twitch channel page, but don’t have your Game/Category set to “StarCraft II” and aren’t streaming StarCraft II, the extension will not appear on your channel and your viewers will not be able to earn or claim any War Chest XP rewards. Q. I’m having trouble with the War Chest extension. What can I do? A. Visit the Twitch Help Center portal for troubleshooting assistance. If you continue experience technical issues with the War Chest extension, please contact @BlizzardCS on Twitter or open a Customer Support ticket.